I’m not Italian and have no right headlining this post as ‘My Italian Grandma’s’ anything. However, I think it fair to say that we all have that one little ole Italian lady that strikes a sweet chord within us. Mine is Annie, a lady, at least 75 years old, that I worked with for ~ 9 years. She truly believed that she was the glue that kept her department together and that no one else could figure out the computer system. She was always ready with a kind word, a random pill from the bottom of her purse, and, the wonders of home-made Italian food — whether it be a main meal or a random selection of desserts. Melt 3 sticks of margarine; add one cup of sugar and cream together (Note, I, personally, use butter). Add three eggs, mix thoroughly and then add 4 teaspoons of baking powder to mixture, one teaspoon of flavoring — organe, anisette or whatever you prefer, mix again. 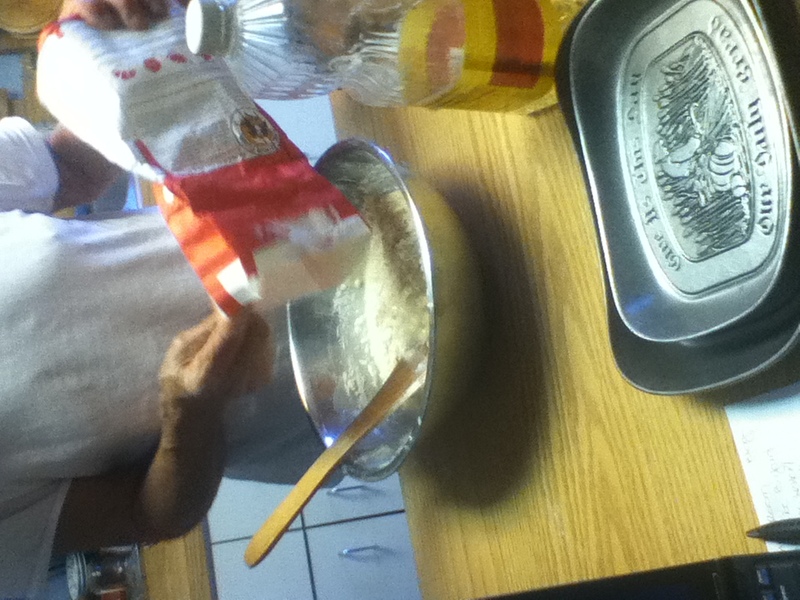 Add 3.5 cups of flour or more and mix again (I wound up using about 5 cups of flour). The doug should be pliable, not stiff. If too soft, add more flour until the dough can be worked and is not sticky but very, very soft. Make round balls, about 1 inch round, bake at 375 for about 15 minutes or until you see that the cookie looks whole and not soft. After the cookies have cooled, make a mixture of 1.5 cups of confectionery sugar, add 1 teaspoon of flavoring (to complement the flavoring used earlier, if not the same one); and 1 teaspoon of water to the sugar. Mix together ( it should be thick, like cream. If too loose, add more sugar), then dip the cookie into mixture and put round, colored sprinkles on top. 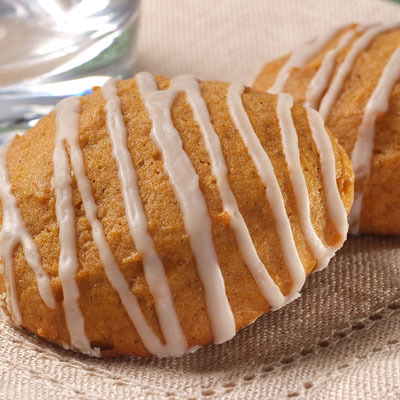 I also made pumpkin cookies tonight (a favorite), but alas, feel woefully inadequate as my aunt had a cookie party recently and wound up with ~1200 cookies. 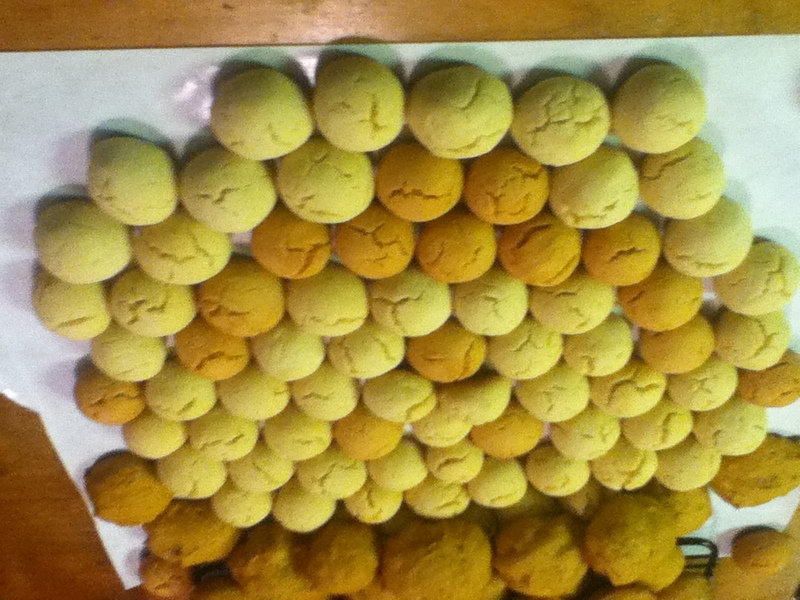 I think I made all of 100 cookies today…oh well, c’est la vie. I’ve known my husband, Tony for about 10 years now. During this time, he’s always talked about his skills as a pizza maker, working in various pizzerias in Bergen County and Doylestown, Pennsylvania where he lived for a short spell. With all this pizza talk, one would think that I have experienced this culinary wonder of his; however, until recently, such was not the case. So much so, that I pretty much tuned him out when the prattling of pizza began to spew forth from his mouth. As I was baking a few weeks ago, the big man, which I affectionately refer to Tony as, started rifling through the cabinets, taking such oddities as yeast out (there’s something I’ve never used, but would like to experiment with). Next thing I knew, he was calling Manny C and, magically, mozzarella and pepperoni appeared. 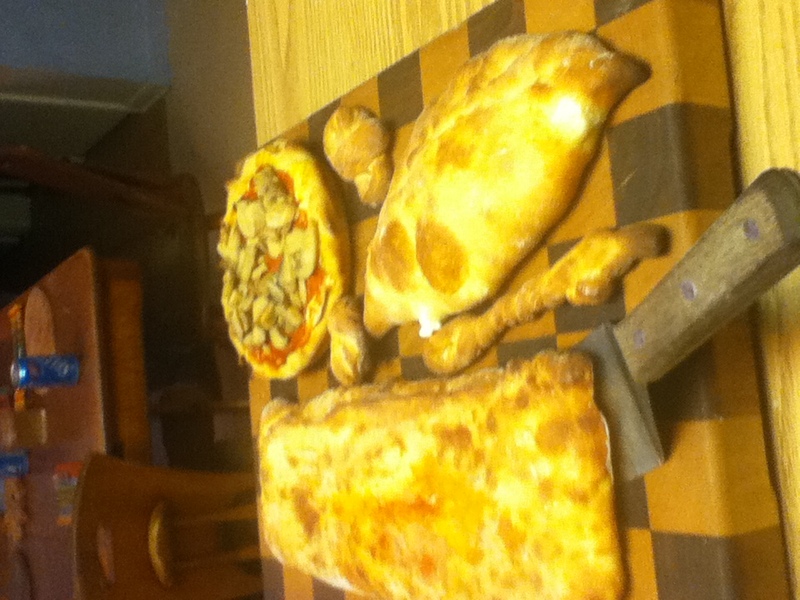 Before I could digest what was happening, we had a nice little pizzeria going on in the house and the most magical thin and deep crust pizza and Stromboli were plattered up (OK, they were tossed onto various cutting boards) for our enjoyment. I’m a fan of the deep crust pizza and have fond memories of going out, in Boston, to Pizzeria Uno. This was when the chain was in its infancy and it was a novelty to dine there. 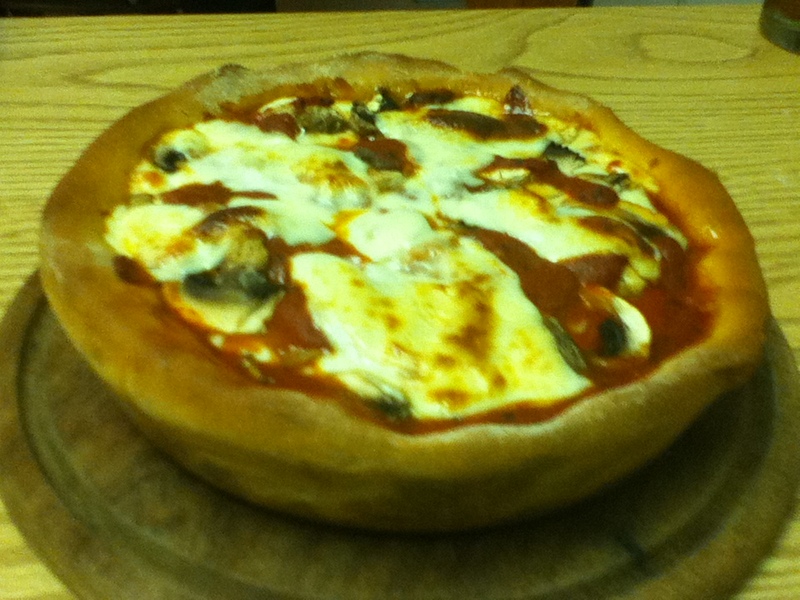 Truth be known, up until a few weeks ago, Pizzeria Uno’s deep dish pizza was my favorite. That’s a huge statement, considering that I live in the Land of Italians and there’s a pizzeria on almost every corner. But Tony’s pizza, with the dough lovingly stretched out across a cast iron pan and layers of sauce, cheese and pepperoni strategically spread out across it, has taken the splendor of pizza to a whole new level. Perhaps, the best part of pizza is the easy, relaxed atmosphere it creates. The first night we dined on Tony’s creations, Manny and his girlfriend joined us and we all noshed appreciatively on the pies while enjoying good conversation and many laughs together. More recently, while my dad was visiting, we talked about politics, the family, and the oddity of the human species all while munching, with great enthusiasm, on a medley of pizzas, Stromboli and, new to the offerings, a calzone. Both Tony and his dad, a former baker, have no issues with yeast. I, on the other had have avoided it like the plague. 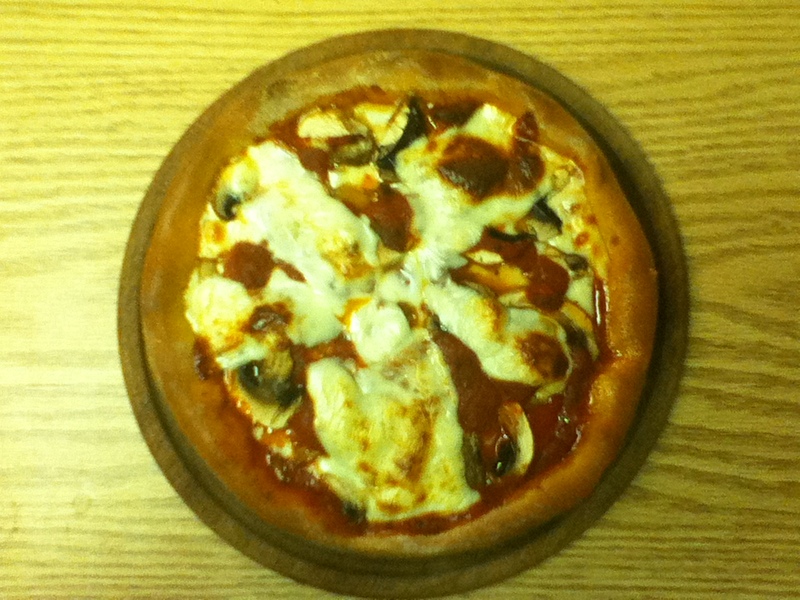 However, whenever I have something home-made with yeast, whether it be bread or pizza, it’s a delight in and of itself. Thus, another epicurean resolution I’m making for 2012 is to bake with yeast. I’m sure there will be a lot of micro-managing between Mr. Rivera and Tony, but I’m confident it will be worth it. As I line up my culinary to-dos, I’m sure, over the holiday season, we’ll be able to get Tony to make a few more pies, perhaps for the video camera so that we can turn all of you into pizza makers.